A natural and delicious treat for your pet! 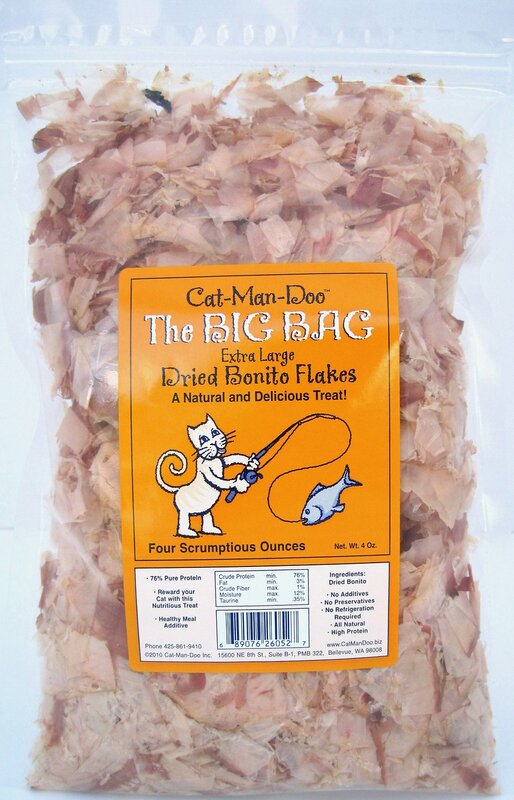 Use the Cat-Man-Doo Extra Large Dried Bonito Flakes as a healthy meal additive or as a nutritious treat! Bonito flakes are among the highest quality flakes on the market and they are derived from a single protein source, making them a healthy choice when rewarding your pet. Cat-Man-Doo flakes are larger, moister and have a fresher aroma and appearance than other Bonito flakes. Because Cat-Man-Doo Bonito is high in protein and low in calories with a minimal fat content, it is the perfect choice for our more “robust” pets. It also contains Taurine which is an essential dietary requirement for feline health. Taurine protects your cat from serious eye maladies. The natural fish oils that are found in Bonito will keep your cat or dog’s fur shiny and beautiful. With no additives and no preservatives this is a great all natural, high protein treat that cats and dogs love! These flakes work as a healthy meal additive or nutritious treat, sure to get your pup's tail wagging or your cat's chest purring. Highest quality flakes on the market, derived from a single protein source. Contains Taurine, an essential dietary requirement for feline health. 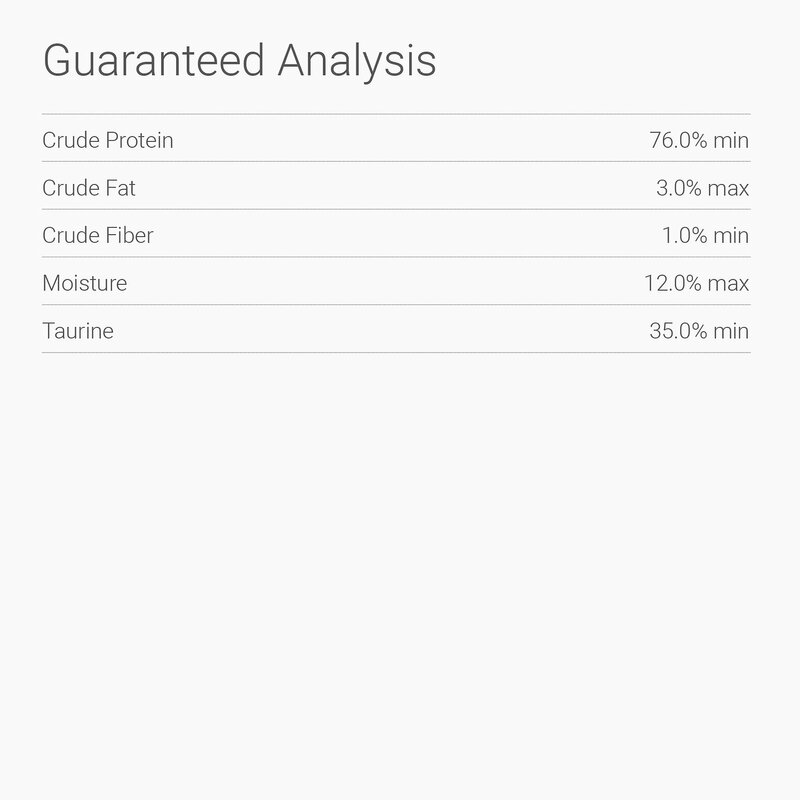 High in protein to give your precious pet energy, while still being low in calories and fat. I purchased Bonito Flakes after seeing it being praised on Instagram. The two pickiest eaters of my four cats loved it. The other two passed on it but the biggest surprise was my sister's dog, Jazz, who perked right up as soon as the aroma of tuna reached her nose. I'm pretty sure she swallowed without chewing before looking up at me for seconds. My cats LOVE this stuff. I got it for an older cat that was having eating problems, but the other two saw it so they all three have a little tuna party every day. Our kitties LOVE Bonita Flakes SO much! It's the first thing they eat amongst their other treats! This is a huge hit in our house! We hadn't had them for a long time and now we need to definitely rethink that! We use these flakes as a healthy, lower calorie treat for our cats, ages 2, 4, 5, 8, and 15. It is enjoyed by all! The only negative for me , personally, is that it smells just like fish! My cat loves this treat! He has diabetes. So he can eat only one protein source food. We couldn't give him anything rather than his main meal. Then we found this one. This treat doesn't make him sick. Of course we give so little amounts, but still, it is enough to make him so happy. She eats around them if I sprinkle a few flakes on her food. She normally likes seafood-based food/treats so I found this kind of surprising. Will not be repurchasing. I got him some for his 7th birthday. Plus he's kinda gained some weight, so gotta lay off the carbs. Anyway, Logan has taught me to give him one of these whenever he gives me a kiss. So I'm going to give these 5 stars. I don’t know what is a bonito. definitely know it’s fish. Maybe it’s the skin? Just make sure u break it up, it’s messy for me, my fur babies LOVE this!